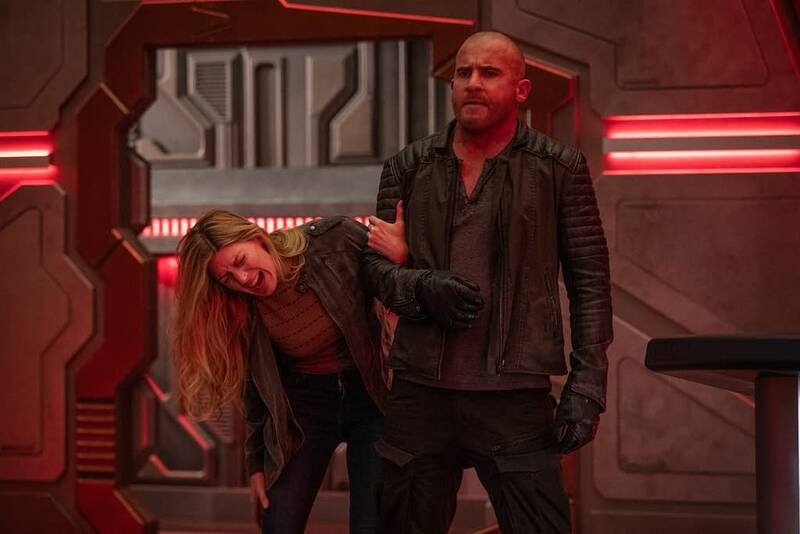 Time for another episode of Legends of Tomorrow and this week’s entry, Legends of Tomorrow Season 4 Episode 7: ‘Hell No, Dolly! ?’ gets weird and emotional, so let’s strap in for the long haul. We begin with a flashback to Constantine wandering into a bar in New Orleans. He makes eyes with the bartender who is the same man we saw in the flashbacks a few episodes ago. They go home together, and this is a physical relationship — so go Legends for showing Constantine’s canon bisexuality and not shying away from it. It turns out this is a dream, as Charlie comes over and wakes Constantine up. She shows him that she can shapeshift ever so slightly and that if her powers are coming back, then he can fix them. He tells her it doesn’t work like that but she doesn’t believe him. She tells him that she survived prison by trading favors and that’s how she plans on getting her powers; when Constantine needs her for a favor. John looks at the medallion in his hand, and it’s the same one worn by the man in the dream. Ava has stayed over at Waverider and finds out that Mick is still using the magical diary from two episodes ago to keep his character from his book, Garima, around. Ava is not pleased about that, but everyone seems keen to let it go because it makes Mick happy. Meanwhile, Ray has grown a terrible-looking mustache because he read in one of Nora’s letters that she likes facial hair on men. As Ray, Sara, Ava, and Zari are sitting down for breakfast, Ray reads some serial killer knowledge off the back of a cereal box that looks like it was intended for children. Ava disagrees with the fact that a Priestess Laveau from 1856 New Orleans would be the most proficient serial killer because Ava is a serial killer nerd. Sara guesses that this means there is a baddie running around and Gideon confirms that there are reports of a serial killer who managed to walk through walls. Back in 2018, Mona gets knocked off of her bike by another Time Agent who insists that she’s the one who has to pay for the dent, even though he didn’t look before opening his door. Mona limps upstairs only to be greeted by a pirate-talking Gary, who is failing spectacularly at flirting [he tries to "neg” her] and Nate tells him so. Nate promises to do some “recon” and find out her interests to help Gary since he’s so, so bad at this. Back on the Waverider, Ava realizes that the profile of the murder victims, young blonde women killed in their bedrooms, fits the profile of the victims of another serial killer named Mike the Spike. Mick storms in and accuses Constantine of taking the diary, but it turns out it was Ava. Ray tries to alleviate the tension with a mustache pun, while Sara assigns Constantine, Charlie, and Zari to go talk to Priestess Laveau. Ray, Ava, Sara, and Mick are off to try and protect the first victim and maybe catch the magical creature in the act. First, we’re off with Zari, Charlie, and Constantine. As soon as he gets on the streets of New Orleans he seems to have a flashback back to the man we saw earlier. He wanders off after telling Zari he’s fine when a man stops him in the street. The man tells Constantine to come with him and when he refuses, blows a purple powder in his face that knocks him out. Constantine wakes up in a coffin and manages to work his way out of it only to find himself confronted by Laveau. We find out the medallion from the man in the dreams runs in Laveau’s family. She pulls the information from Constantine’s mind. 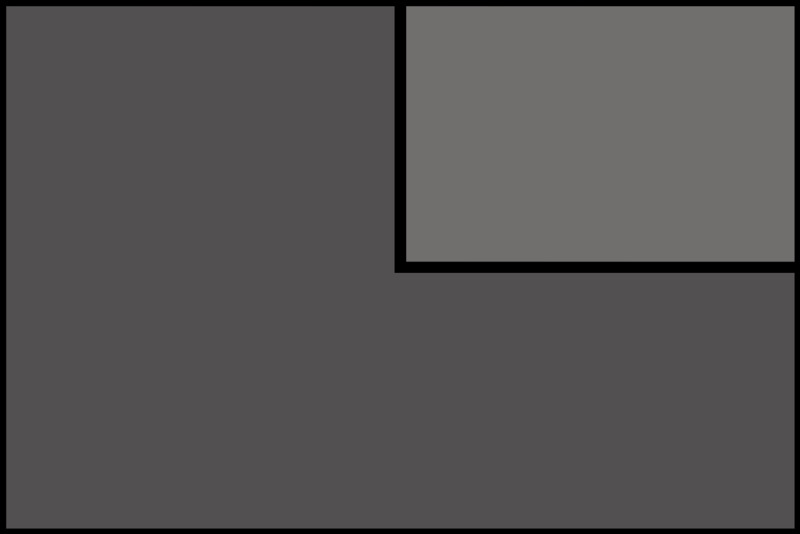 The man is Desmond, and the two of them were together. Constantine tells Desmond that he needs to leave town for his own safety, there is a very powerful demon, and Desmond gives him the medallion to keep him safe. Laveau says that Desmond must have loved Constantine to give him the medallion and asks if he loved him back to which Constantine says nothing. Meanwhile, things are not good between Mick and Ava as they tail the first victim. Ray tails a guy they think looks creepy but he ends up being harmless. Ray finds a little girl crying who says her doll is going to kill her mom. Ray tries to figure out what’s going on before he’s knocked out with a shovel by a different doll. Zari and Charlie are trying to find Constantine who turned off his communication device but Sara sewed trackers into all of his underpants because of course, she did. Constantine is still with Laveau and she asks what happened to Desmond. John says that a demon named Neron was the problem and Desmond was collateral damage. Laveau insists that Constantine save Desmond just as Zari and Charlie arrive to “save” him. Constantine doesn’t need saving and they asked Laveau if she’s felt any other magic in the area. She says she’s felt a spirit from another time. She calls it a Dybbuk and Charlie explains that it is a dislocated soul so wicked it can’t cross over. Constantine tells Laveau that they need to catch the spirit or she’ll be blamed. She gives him the medallion back with a knowing look as Zari informs the team of what they’re up against. Sara finds Ray knocked out and the truly creepy-looking doll attacks Sara because she fits his victim profile. She manages to fight it off before Mick and Ava show up. Mick uses his gun and fries the doll to a crisp. Now back on the ship, Constantine asks Charlie if she wants her powers back, and she says yes as they go off. Constantine wants to try and change time using the logic that if he never meets Desmond, he’ll never join the Legends, and never take Charlie’s powers. She goes into the pub where Constantine met Desmond, posing as Amaya, and takes him away so they don’t meet. Back at the Time Bureau, we see Mona talking to the Konane creature and ranting about her day. He looks like he got hurt by something but he can’t tell her what. Later on, she’s walking with Nate and Nate is trying to drop hints about Gary and Mona seems on board to tell someone she has feelings but it doesn’t look like it’s going to be Gary. 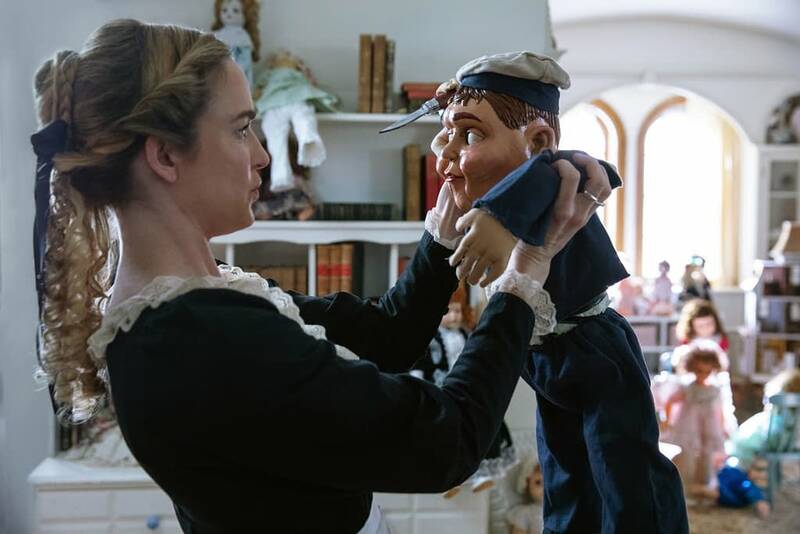 Sara convinces Ava to stay for dinner, while also saying that Mick is a good guy, and we see the doll’s hand move. Meanwhile, Charlie and Constantine are on their way back, thinking they’ve fixed it when Constantine realizes all they did was delay him meeting Desmond by a few days. Zari knows they are up to something and brings the jump ship back to the Waverider. Constantine explains to Zari and Charlie the whole story. He was legitimately in love with Desmond and they lived together for six months. Neron shows up and wanted Constantine’s help usurping the Triumvirate that are ruling hell. Neron also happens to be the demon that current has dibs on Constantine’s soul. Constantine explains that Neron was the one who dragged Desmond to hell. Zari sympathizes with the desire to change history and promises to look for a loophole. Back at the Time Bureau, we appear to have a full-blown Shape of Water situation because the guy Mona is into is Konane. She confesses to him using his language and they are having a moment when two guys storm into the room. Konane gestures for her to hide as she watches two strange men cuff the creature to take him away. Back on the Waverider the Dybbuk leaves the burnt doll and goes in search for another body and it finds something in a case. Constantine tells Charlie that he’s figured out another way to save Desmond because their meeting appears to be a fixed point in history. He’s going to go back in time and break Desmond’s heart. The dinner Sara planned is not going well as Mick joins them and says some rather cruel things to Ava about her being a clone. We see a tiny hand take a knife from the table. 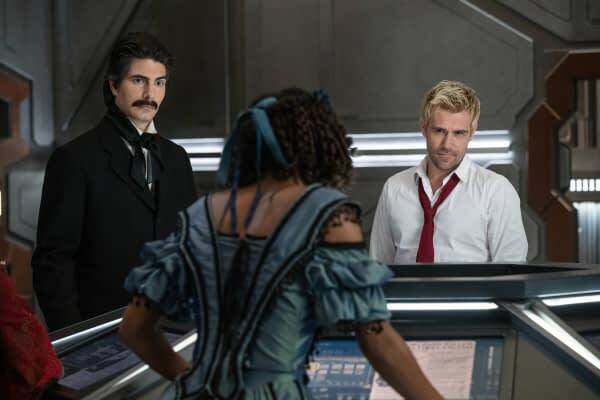 Zari walks into the library to confront Constantine about not being able to find a loophole and finds shapeshifted Charlie. She dropped Constantine off in the past and came back. When Zari asks her why she did it Charlie explains that she’s so desperate get her powers because now she’s aging. When she shifted she was reborn and thus she was immortal and the idea of dying doesn’t sit well with her. Sara finds a broken bag of flour, tiny footprints, and they realize the Dybbuk is alive. Just as Ray is about to shave his mustache the power to the ship is cut. Ava and Sara split up to find the Dybbuk while Zari and Charlie take the jump ship to get Constantine. Zari calls him and begs him not to do this. Turns out that Desmond bound his soul to Neron to protect Constantine and to banish Neron back to hell meant banishing Desmond as well. There is no talking Constantine out this and he is determined to break Desmond’s heart the consequences be damned. Meanwhile, we find out that Mike the Spike has possessed the Martin doll that Leo Snart used to try and help the Legends cope with death. Mick saves Ava despite their fights but they can’t catch the puppet. It eventually confronts them all in the main lobby of the Waverider after Sara gets the power back on. Mona follows the men taking Konane as they try to stuff him in a car. 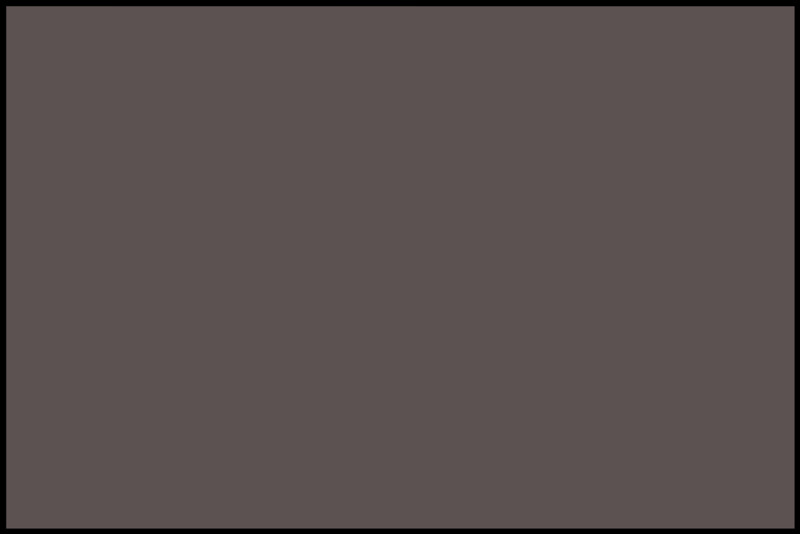 She stops them but Konane breaks free and ultimately wounds her. All of this is happening as Zari and Charlie on the jump ship trying to stop Constantine, but it’s too late. He breaks Desmond’s heart and the medallion in his hand vanishes, indicating history has changed. It sends out a wave of power that freezes everyone, both Mona in 2018 and the Legends on the Waverider mid-air. We see the wave hit the jump ship. Charlie comes to and has her powers back but Zari has been transformed into a cat, clearly, something has gone very wrong. American Gods Season 2: “We All Need a Savior,” a Premiere Date and Official Poster, Too!